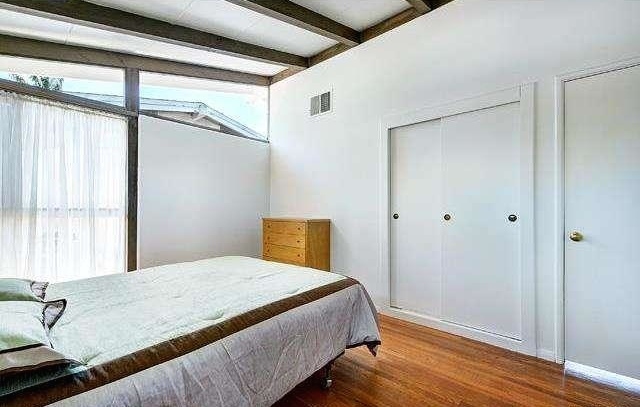 Agent Comments :: This is a bright and airy, classic mid-century modern home designed by renowned architects Palmer & Krisel, and features their signature post-and-beam construction, open floor plan, floor-to-ceiling glass and clerestory windows. It also features a seamless indoor-outdoor flow to the spacious back yard with gleaming pool, fig trees and table grapes. The fourth bedroom/den opens to the partially covered lanai for year-round outdoor living and entertaining. The light-filled, comfortable space boasts beautifully refinished hardwood floors and kitchen cabinets, new kitchen flooring, a Maytag gas oven, O'Keefe & Merritt gas range, new interior and exterior paint, and a wood burning fireplace. The roof is new, as are the sprinklers. The Master Bedroom has three ample closets, and the two adjoining bedrooms have a floor-to-ceiling view to the pool and backyard, as do the living and dining rooms. This beautiful home is situated on a lovely, tree-lined cul-de-sac with other Krisel designed and built homes. This home is for those that want to truly live the classic Southern California life style. Come see this one.